Sony’s SLT Alpha 58 is a single lens reflex camera with an APS-C sized CMOS sensor of just over 20 Mpix. The Alpha 58 has all of the features that you would expect in a DSLR, and unlike the majority of its competitors, it also has image stabilization built into the body rather than having it as a feature of the lenses. Stills can be captured at rates up to 8 frames per second and movies in full HD. The monitor screen, at 6.7cm, with 460k dots, is slightly smaller and lower resolution than some of its competitors and it tilts, but does not swivel. The camera’s sensitivity ranges from 100 ISO to 16,000 ISO, again falling short of some competitors but not by very much. As with other Sony Alpha cameras the lens mount will accept Sony and Zeiss ‘a’ mount lenses and also the wide range of lenses on the second hand market with Minolta’s AF mount. 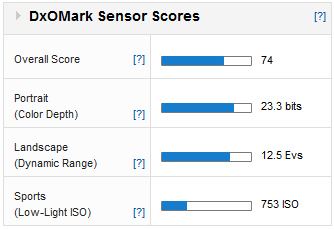 The DxO Mark scores for the Sony SLT Alpha 58 seem at first glance to be pretty good. 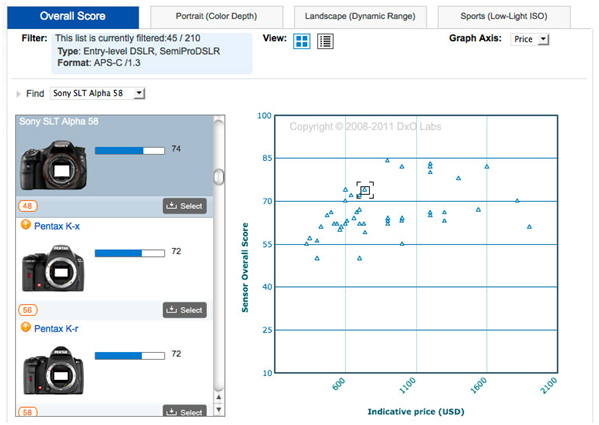 Scoring 74 overall, with a color depth of 23.3 bits and dynamic range of 12.5 EVs. Only its low light score of 753 ISO fails to place the Alpha 58 in the top quarter of all the Entry-Level and Semi-Pro DSLR cameras that DxO Mark has tested. Having said that, these scores seem pretty good. Then you need to look at the price of this camera. When you do it puts a new perspective on the results, elevating them into something rather remarkable. The Alpha 58 does better than many cameras costing very much more. If you are looking for a new DSLR camera in this category – entry-level, but versatile – the Sony has some keen competition, and Nikon’s D5200 and Canon’s EOS 650D are probably the closest. Looking at the data it is clear that the best performance comes from the Nikon D5200. 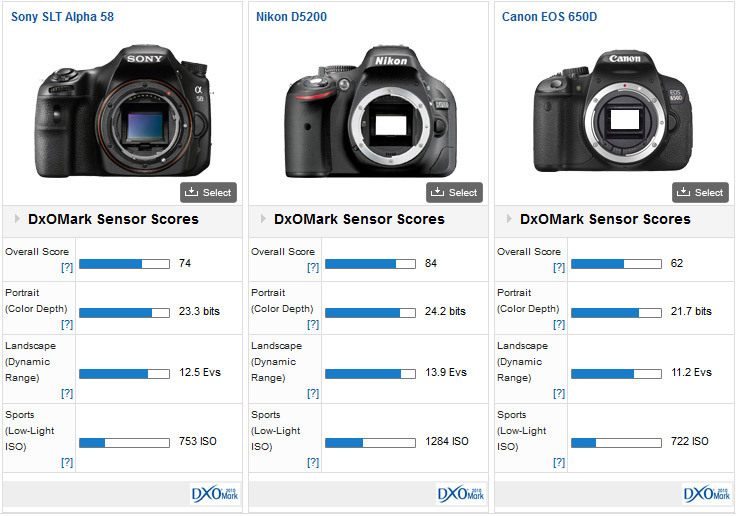 Its DxO Mark score of 84 is exceptional, placing it at the top of all APS-C DSLR cameras. However the Nikon is about 25% more expensive than the Sony, and so may be out of reach for some. The Canon EOS 650D seems outclassed among the three, and it has been recently superseded by the EOS 700D (as yet not tested by DxO Mark) which has very similar specifications but the cost of either is significantly higher than the Sony SLT Alpha 58. The specifics of the scores place the Nikon D5200 ahead of the Sony in all measures by a reasonable margin: DxO Mark score 10 points ahead, 0.9 bits of color depth, 1.4EV dynamic range and close to a stop of low light performance. They place the Canon behind the Sony by a similar margin: 12 points in the DxO Mark score, 1.6 bits of color depth and 1.3EV dynamic range. When you consider that the recorded image from the Sony has passed through the fixed, translucent mirror it might be easy to imagine that the Canon would have had an advantage and that it might have pushed the Sony back into third place of the three, but Sony has actually made a very good and very reasonably priced piece of kit. The scores for these three DSLR cameras place the Sony SLT Alpha 58 bang in the middle of the group, but as the cheapest by far of the three it wins hands down for value. 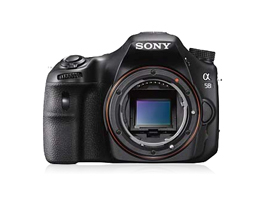 The Sony SLT Alpha 58 is billed as an entry-level DSLR; it certainly fits this category well. However it does all of the things that a semi-pro DSLR should do too, nearly as well as Sony’s own Alpha 77 which sells for about twice the price. There is a better camera in the entry-level category, the Nikon D5200, and Sony’s old model the SLT Alpha 35 was very good too, but looking only at what is available now, and taking the cost as well as the quality into consideration it would be very difficult indeed to do better than the Sony SLT Alpha 58.